Sometimes when I think of recipes to share, I think to myself “everyone knows how to make that” but then I have to remind myself that not everyone does. 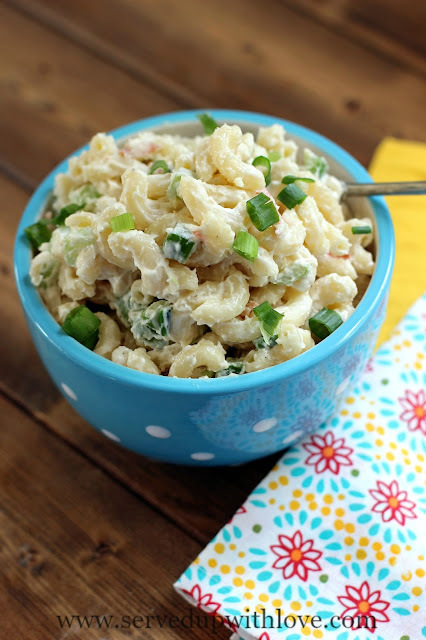 Macaroni and potato salads are those kinds of recipes that you just expect everyone to know how to make. Everyone’s mom or grandma has their special family recipe that gets passed down through the generations. It’s a way of life for some families but I have to remind myself that not everyone has those kinds of recipes. So if your grandma made the best, I am sure this one doesn’t compare to the love she put into her salad. We tend to buy macaroni salad at the grocery store when we have a BBQ and every now and again I skip that and just make this recipe. 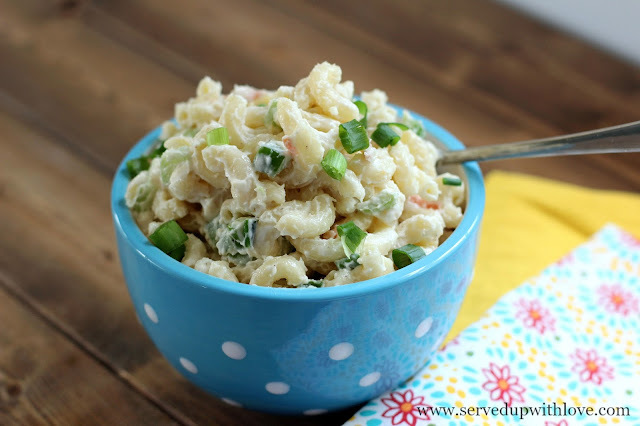 Macaroni salad is always a favorite at potlucks and BBQ’s. It is really a “dump in what you have” kind of recipe. Cheese cubes are also a great addition to this summer salad. Have tomatoes? Dump them in. The possibilities are endless with this recipe. Cook the macaroni noodles according to package directions. While that is cooking, prepare the vegetables and green onions and place in a large bowl. Add in the mayonnaise, salt, and pepper. Once the macaroni is done, drain and rinse with cold water. Dump into the bowl with the vegetables and mayonnaise mixture and combine until noodles are fully covered. Place in the fridge to chill. I often add fresh or frozen corn or peas as well, and it adds a different way to eat ones veggies and enjoy them in a cool summer dish! Yes, love this! It is such a versatile dish. This sounds tasty and so simple, Melissa!